Thanksgiving Desserts + 1,000 Vegan Recipes Cookbook “Thanks-Giveaway”! For most of last week’s Thanksgiving posts, the subjects were savory. Today we get to the important stuff: dessert! One of the great thing about traditional Thanksgiving desserts is that they are easy to veganize and they can be a wonderful way to introduce omnis to the wonders of vegan food. The problem at my house is limiting the holiday dessert to just one, especially since we all have our favorites. Jon loves apple pie, I’m crazy for pumpkin cheesecake, and I heard a rumor that one of our guests this year is craving pecan pie. This super-rich, nutty pie needs no embellishment, but adding a scoop of vanilla is hard to resist. To save time, you can substitute a ready-made vegan pie shell instead of making it from scratch. This recipe is from 1,000 Vegan Recipes by Robin Robertson. For the crust: Preheat the oven to 400°F. Place the flour and salt in a food processor and pulse to combine. Add the margarine and process until crumbly. Add enough of the water to form a soft dough. Roll out the dough on a lightly floured surface and fit the dough into a pie plate. Trim the dough and flute the edges. Prick holes in bottom of dough with a fork. Bake until golden, about 10 minutes, then remove from the oven and set aside. Reduce the oven temperature to 350°F. For the filling: In a small bowl, combine the cornstarch and the 1/4 cup water and set aside. In a medium saucepan, combine the remaining 3/4 cup water, maple syrup, and brown sugar, and bring to a boil over high heat. Boil for 5 minutes then stir in the salt and the cornstarch mixture. Cook, stirring until the mixture thickens and becomes shiny. Remove from the heat and add the margarine and vanilla, stirring to melt the margarine. Add the pecans, stirring to coat. Pour the pecan mixture into the prebaked crust, spreading evenly. Bake for 30 minutes. Cool on a rack for about 1 hour, then refrigerate until chilled. THANKS-GIVEAWAY: To celebrate Thanksgiving and share the bounty of vegan recipes in my ultimate vegan cookbook, I’ve having a Cookbook Giveaway this week for a chance to win a copy of 1,000 Vegan Recipes. For a second chance to win (and also to help spread the word) link to this giveaway on your own blog, or on Facebook, and/or Twitter, and then leave a second comment here. 1000 Vegan recipes is my favorite go to cook book, I can always find something amazing with ingredients I already have in my pantry/fridge. Shout out to the beet salad, family favorite. I am thankful for so much this year, my health, is back, my son’s NF is at bay for now, and My new job… and my passions…. I love this book and need a new one because mine is in pieces from over use. I made the pumpkin cheesecake with cranberry drizzle one year for Christmas and it was a hit! I would love to have a copy of this so that I could indulge myself as well as review it for my blog. Favourite Thanksgiving-like dessert? Definitely a vegan version of my grandmother’s Québecois sugar pie. Fingers Crossed. I don’t have this one yet. I am thankful for Family, Friends, and Finius, Hubbard, and Shamrock Kitties! Thanks Robin. Happy Thanksgiving to you. I just bought Fresh From the Vegan Slow Cooker and it has quickly become my favorite cookbook. I shared this in my Facebook cooking group, Vegan Cooking from Around the World (http://www.facebook.com/groups/VCFATW/). I am thankful that I met you. In just a year I have learned a great deal and have enjoyed working with you. This may be the only cookbook of yours that I don’t have—but would be very thankful to! Dessert wise, for thanksgiving pumpkin pie has got to win out! But in general, I can never refuse a chocolate cake! Happy Thanksgiving to you and all your readers! My favorite thanksgiving food are the desserts! (especially the pumpkin pies, sweet potato pies and pecan, yum!) Sharing this on my FB Wall, too! I’m excited for my first vegan Thanksgiving! I’m thankful that the accident that put me in a wheelchair didn’t kill me, and that I have such a wonderful service dog. I’m thankful for the son who became my caregiver, and makes such wonderful vegan meals for us, and the Church ministry that learned to make vegan meals so they ccould provide meals for us twice a week. Those lovely women had no idea about “vegan” and have done a lovely job with love. I just used 1,000 Vegan Recipes to make a quinoa salad for a church potluck. It’s my go-to cookbook. I think that would be a really cool idea as a prop. I’d have to say (other than the obvious, health, freedom, etc), that veganism/plant-based eating has really started to take off. Everyone is becoming vegetarian (and most vegetarians are taking that step to become vegans). It’s becoming so mainstream now, Ellen’s a big voice for the vegan movement, veganism is popping in on the “Food Network” (Chloe/Doron on Cupcake wars, yay for them! ), now we just need to have full shows! And You Robin, just every year you come out with fantastic books! You’d think after 1000 (and all your others!) you’d be stumped, but you just keep showing the world, we can eat fantastically without having to cause animals suffering. And now. Let’s talk about that pie…. My favorite Thanksgiving dessert is apple pie or New York style cheesecake. Great giveaway! Thanks for the giveaway. Good old fashioned pecan pie is my favorite Thanksgiving dessert. However, I’ve never found one that sets up the gel in the pie like my Mom used to make. I should try yours! I’m thankful for a great decision i’ve made this year – going vegan! Retweeted your giveaway on twitter! Linking to my Twitter (@Mandoo322) and also my FB. I’m thankful that I live in Jerusalem, even with the falling rockets. I’m thankful for puppy snuggles 🙂 Happy thanksgiving, everyone! my favorite dessert is pecan pie! My favorite Thanksgiving dessert is your Pumpkin Cheesecake! My husband votes for a Pumpkin Pie. You and your books are two of the things I’m thankful for this Thanksgiving. Right after my wonderful husband, my dogs, my old friends. I think of you as one of those old friends! Many thanks!! Vegan dessert this year for Thanksgiving Day is organic Apple Crisp – YUM! Thanksgiving is my favorite holiday – a day of quiet reflection on our many, many blessings. Gratitude should color every day of life. I’m so glad I finally came to your website! Your slow cooker book has been a staple in our house for years. Thanks! Thank you so much for your generous giveaway. This book has been on my wishlist for a while. I love Vegan food, the more I eat the more balanced I feel. I bought your “VEGAN: FIRE & SPICE” cookbook from PETA when I first went v*gan and have turned to it for ideas & inspirations often over the years. One of my faves is the “Brown Rice & Bean Salad in Cumin Dressing” which I used to demonstrate how simple yet delicious & healthy vegan food can be at our local 4-H group here in Honolulu. The video has been seen more than 1500 times on YouTube since January. Mahalo nui loa, Robin, for all your wonderful vegan recipes! I love Robin’s cookbooks! This one is on my wish list too. I would love to have “1000 Vegan Recipes”! My husband and our 2 vegan Pittie Princesses have loved every one of Robin’s recipes that I’ve prepared for us. I need to add 1,000 Vegan Recipes to my RR cookbook collection! In the meantime, I’m looking forward to some good slow cooker recipes from the latest which is already on my shelf! Sending Thanksgiving kisses to the kitties–Gary, Mitzki, and Peanut! I love chocolate pumpkin pie! My favorite Thanksgiving dessert is pumpkin pie with a pecan crust. So good! I love apple pie with a big scoop of vanilla ice cream! I’m thankful for pinterest recipes, blogs like yours and (hopefully) this cook book, so that I can enjoy the holiday seasons healthily and vegan style! I am thankful for the support and love my family and friends have provided during my 4 years of medical school. I will soon graduate in May and could not imagine getting through medical school without them! I am thankful for a healthy, loving family for whom I get to cook Thanksgiving dinner. When it comes to dessert, you can’t go wrong with apple pie, but pumpkin pie will also do. Would love to win this book! It is one of yours I don’t own and I would really like to have it. I am thankful for many, many things. My husband, my daughters, my dogs, my extended family and friends! Too many blessings to list! Apple pie or apple crumble are my favorites. Now I am making myself hungry. Yay–I would love to win a copy of this book! Thanks so much for the giveaway! I am so very thankful for the WONDERFUL summer we had here in Oregon this year. Beautiful, sunny weather for months on end really beats the rain and the seasonal blues. I got to do so much camping, hiking, biking, and general exploration… made my year. I am still deciding on what dessert to make for Thursday. I will probably end up making two. I would love to try this Pecan Pie!!! Lemon Blueberry Almond Tart is my favorite T-day dessert. Cheers! My favorite thanksgiving dessert is what I call “cape cod cookies,” white chocolate chip, cranberry and macadamia nut cookies. I am very excited by all of the great vegan recipes that don’t involve store bought processed food. I am thankful for my health and the ability to eat in a manner that will maintain it! I am very thankful for your contest and that opportunity to win a free copy of a wonderful cookbook! Pumpkin cheesecake, be still my heart! I would be thrilled to win 1,000 Vegan Recipes. I have had my eye on this book for a while. I purchased Vegan Planet and have it enjoyed those recipes. The slow cooker Vegan looks good as well. Those 2 pies look fantastic. When one looks at them and how delicious they look, it is amazing they have no dairy, eggs, etc. I posted on Facebook as well. 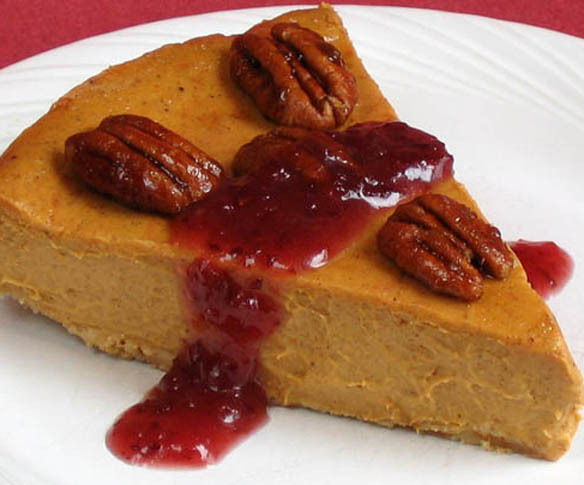 The Pumpkin Cheesecake with Cranberry Drizzle and the Pecan Pie look delicious, and I would like to make these recipes. In the past several months, I have checked out some of your books from the library as well as other books on becoming Vegan. It is exciting and encouraging to find all these great recipes that do not require dairy etc. When one decides to eat the Vegan lifestyle, one realizes the huge abundance of variety awaiting them in healthy, whole foods. I hope I win your 1,000 recipes because I have had my eye on this book. I need to cook a vegan breakfast casserole for my bible study in a few weeks. I don’t think they will miss the meat and dairy if I find the right recipe. I am thankful for all the recipes you have provided and for all the love. I ‘m happy this year to be seeing my mom (who I haven’t seen in 1 1/2 years), and my uncle who I haven’t seen in 15 years! Can’t go wrong with an apple pie, and so easily vegan too! This is my 1st Thanksgiving without my Mom. I am so thankful for the many happy memories and all the love she gave to me. Mom LOVED Thanksgiving, not the cooking, but the family being together and the eating. Thursday, on Thanksgiving, I will celebrate for Mom. I would love love love to win this copy of your book. Our entire family has been transitioning to the vegan diet, and we’re finally there. Love your books as a resource for this journey! I can’t wait to make my first vegan pumpkin pie this Thanksgiving! I have this book already – but since I know how awesome it is, I’d love to have a copy to giveaway for Christmas! Somehow I’ve missed the pumpkin cheesecake recipe – I’ll definitely be trying that this year. I am thankful for my new husband and my wonderful son! I’m making vegan pumpkin pie for the first time this Thanksgiving. I am thankful for the health and happiness of my family. I am also thankful for my daughter for introducing me to the vegan lifestyle. Last, but not least, I am thankful for you for giving us such a wonderful blog full of information, beautiful photos, and inspirations. I am thankful for my family and friends. I am thankful that my mother is going to give one month to being vegan. I am also thankful that my family has no converted to a vegan friendly Thanksgiving, someday I hope it will be fully. And I love chocolate pie and can’t wait to have some!! I also tweeted to share the giveaway! I am grateful for the friends who shared an early vegan thanksgiving dinner with over the weekend. They are not vegan and didn’t know what to expect. They arrived curious and with open-minds. The left with satisfied bellies and a positive view of vegan food. It was a good experience for all! I am thankful for my family and our health. I’m also thankful for the creativity that comes from being vegan. I’m excited about “veganizing” my old pre-vegan Southern cornbread dressing. I rarely make recipes over and over so I would LOVE to have 1000 more to try! I also retweeted the notice of the giveaway! Hi Robin, Your deserts look wonderful! The pumpkin cheesecake looks particularly enticing. For our Thanksgiving, I’m thinking of baking your Great Northern Apple Cake. Not traditional Thanksgiving, but I think the apples give it the fall flavor. I am thankful for my wonderful family. I am thankful that my family is healthy and we have a home over to live in. Your recipes are so appealing! I have a copy but would love one for my newly vegetarian niece! I am thankful for all 5 of my kitties! I have never been a big dessert person except that I love brownies and cheesecake. The picture of the pumpkin cheesecake on this post looks scrumptious! I would looove to win one of your book! One of our favorite Thanksgiving desserts has been a Cranberry-Apple Pie which combines two of the seasons stellar fruits. 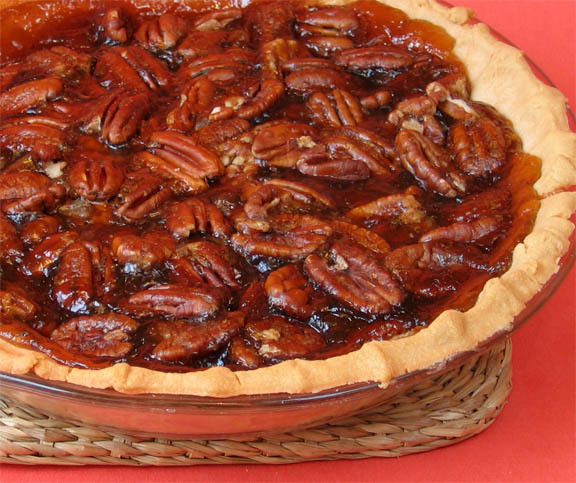 Your Pecan Pie looks so good that we may have to try that this year! I am thankful for my absolute sweetheart of a son. He brings joy to me every day. I would be so thankful to win this book! I’ve been searching everywhere for a vegan pecan pie recipe. Wow! Those pies look so good! And since I am new to world of vegan food (my naturopath has me going vegan) I would love to have the cookbook. Vegan pumpkin pie is The best tasting pie ever. I just made a Pecan Pie the first time in my life and it was vegan of course, but it was awesome! I have never enjoyed food until I became vegan. Oh my, if the Pumpkin Cheesecake recipe featured here is any indication of what the 1,000 Vegan Recipes cookbook contains, I’ve got I have a copy! And I mean right now! Oh, and I just posted this to Facebook, too! 1,000 Vegan Recipes is already on my wish list on Amazon because I’ve wanted it for a while now. I’m thankful for so many things, but one that stands out right now is the fact that my wonderful husband has embraced my vegan diet and praises everything I cook for our family. He has been incredibly supportive and encouraging. I have friends whose husbands thwart and sabbotage their attempts to eat a healthy diet, and it just makes me more thankful for my awesome husband! I collect your cookbooks, not only because they”re good for us but because they taste good! I have purchased only a couple of vegan cookbooks (including Vegan on the Cheap) since becoming a vegan 1.5 years ago so I’d really love this cookbook! I am thankful for my health & my family. Mylene, I joined your group! I’m thankful for getting a new job after being unemployed for a year. I am thankful that there are a lot of people who believe we can be healthy and have compassion for animals at the same time. I love apple pie because the smell of it baking reminds me most of my Mom. I am most grateful for her & the unconditional love she provides. Through her example I learned both to give & receives all the joys of life. I am most thankful for this gift that continues to give to all, humann & animal alike. Happy Thanksgiving! Your cookbooks are da best ! This year, I am thankful for you and your cookbooks! Keep up the great work. I’d love to win this cookbook. I’ve been cooking from your new Slow Cooker cookbook and already have a few favorites. Hubby (not vegan) asked for the tortilla soup today. Yum! I’m thankful that I get to live a vegan life, and that I get to have a vegan Thanksgiving. I am thankful for the great strides that veg*nism has made each and every year, resulting in more options for us outside the home. While I doubt the whole world will change, it’s comforting to see the small changes happening around us. Happy Thanksgiving everyone! I am thankful for the loved ones in my life even when they drive me crazy. Also I’m thankful forthe great blogs I’ve discovered and the people on them that I met this year. It’s been great! I’m thankful for my omni husband who supports my eating choices ( and willing to try some of my meals!). Having another thousand recipes at my arsenal would be fantastic. Thanks for the great giveaway. Have a good Thanksgiving! My favorite Thanksgiving dessert is my no bake pumpkin cheesecake which I am trying to veganize this year. I hope it came out ok. I am thankful for so many things. Most importantly that I have my health, a roof over my head, and enough money to buy food. We often forget how many people there are who are homeless or don’t know where their next meal is coming from. We should never take these things for granted! I’m grateful for fabulous, cruelty-free food! I’m so thankful for health and happiness, wonderful friends and great food blogs! I am so thankful for my family and the time I get to spend with them. I’ve been mining recipes from your blog. A cookbook would be awesome! I’m excited to try a new stuffing recipe this year and I’m thankful to share a vegan meal with my non-vegan family! I am thankful for my family and my wonderful husband. AND the opportunity to win more recipes to help with my healthy quest! I have and love “The Vegetarian Meat & Potatoes Cookbook” and “Fresh From the Vegetarian Slow-Cooker” and would love to add this one to my collection. The “Slow-Cooker” is my favorite cookbook for the winter months and one reason I look forward to them! I shared the post on your FB page, couldn’t figure out how to send a friend request so I could post this in the comments, but did subscribe. Thank you for all the wonderful posts and recipes. My mouth is watering after discovering that Robin Robertson has written more books besides Vegan Planet (which I borrowed from the library last week.) Now on to 1000 Vegan Recipes and Fresh from the Vegan Slow Cooker! I am new to vegan cooking and as a nurse practitioner I intend to teach more people the how’s and why’s of becoming vegan too. I am so glad I discovered you, Robin. I never had pecan pie this looks soooo good! This was my first vegan Thanksgiving – Tofurky, roasted vegetables and fresh fruit! Thanks so much for all your delicious recipes. One of my standbys for Thanksgiving is my raw cranberry relish. In blender, add one bag of cranberries with a peeled and seeded orange and maple syrup to taste – and blend away. So Delicious! I don’t celebrate Thanksgiving, but I love pumpkin pie. This would make a great gift for my mom, who’s trying to transition to a vegan diet! My favorite Thanksgiving food is sweet potatoes..in pie form or baked alone. I am thankful for my 2 cats and for your slowcooker cookbook! fave thanksgiving day dessert….. i’m old school, so i love pumpkin pie. This was my first Thanksgiving as a vegan. I still have a lot to learn, but it was was a great start. I’m thankful for my very gracious friend who is passing her slow cooker on to me so I can buy your new slow cooker book and enjoy your delicious recipes! I’m thankful for the chance to change my cooking and eating habits without leaving out flavor! I’ve been a vegan for a long time, but I’ve never had a cookbook. I’m thankful for being lucky in the kitchen, despite my lack of direction–but I’d love to finally have a wonderful cookbook for new ideas. For our Thanksgiving I made a delicious vegan gravy, and it was even the meat-eaters’ favorite element. I love being able to satisfy even the pickiest of eaters. I’m thankful for a great group of friends who came together for our thanksgiving away from home, as well as a wonderful girlfriend who links me to awesome recipes (and contests!). What a generous offering! Thank you, Robin. This year, though I was away from home and from my family, I was blessed enough to get to celebrate two Thanksgivings: I celebrated the Canadian one in October, as I am Canadian, and, because I work with Americans in Italy, we celebrated American Thanksgiving just last week. How special to have been a part of two celebrations of gratitude—not to mention being in the company of individuals who, despite not being vegan themselves, went out of their way to make vegan food for me. What a delight! I love pumpkin pie, but I need to try that pecan pie recipe! Just love your cookbooks! I recently purchased Vegan on the Cheap and am excited about trying to make seitan from scratch. Thanks for so many wonderful ideas for creating tasty meals that are easy on the budget, too. 1,000 Vegan Recipes would be a wonderful addition to my library! I am greatful for so much this year, especially my 72 lb weight loss with a 100% plant strong diet! I have several of your books to help me along with my diet, but not this book. I would love to win it! My favorite vegan Thanksgiving meal this year was the hashbrown casserole! So good! I would love to win this cookbook. I have heard so much about and am very curious. I have also heard that its easy to make McDougall friendly which is important to me. Very thankful to have found your cookbooks. The Moroccan pumpkin soup was a hit at thanksgiving this year!! Though I’ve been vegan for about 7 years now, I’ve never eaten a Tofurkey. While my homemade main dishes have always been excellent, I do wonder what the classic vegetarian dish tastes like. It’s a combination of soy and gluten, right? Made the stuffed buttercup squash recipe from Party Vegan for Thanksgiving…love your recipes RR! I love your recipes! I am so glad that I found your website! for the opportunity to enter. I am thankful for finding this website with so many wonderful recipes and information. Would love to win the cookbook so I can share great vegan dishes with family and friends. I am thankful for my amazing 17 year old son who is choosing not to eat animals like his Mom. I have been trying out your great slow cooker recipes and they are delicious! Would love another of your vegan cookbooks. New to this way of eating. Replacing my cookbooks with healthier books. this would be a great addition. I would love ur cookbook. The recipes look yummy. I’m always challenged with cooking something that’s vegan. I switched to a vegan diet for health and all hints and info help…..ALOT! Thank you so much for the pecan pie recipe, can’t wait to make it and try some of your others. Just learning about being vegan. This makes it fun! I am trying to learn good recipes for my son and daughter-in-law. Everyone comes over for Sunday dinner but they have to bring their own food. As a mother I feel bad about this. So am going to try some great vegan recipes from here for Thanksgiving!!!! Sounds delicious! I can’t wait to try it and see how it compares to the family recipe! I am thankful for a roof over our heads and food in the refrigerator. Thankful to spend the holiday also my 60th birthday with friends and my family (84 year old mom and daughter). It’s a challenging time in our lives and so important to focus on the good in it. thankful to Robin for her inspiration too!